A trio of exhibitions I visited last week: three of them are closing within the next week, while the third one closes next month. All are worth the effort. 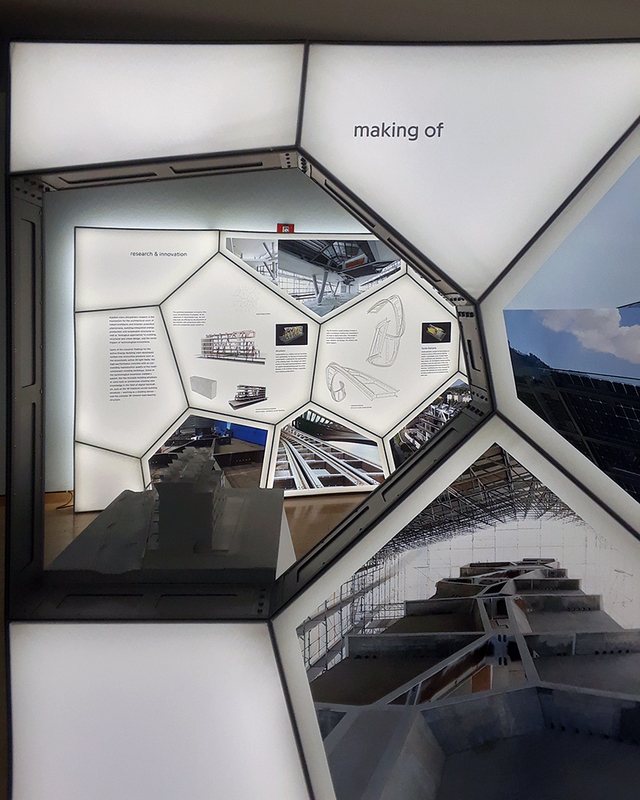 There's a double appeal to this small exhibition: learning about the design, research, and construction of the Active Energy Building in Lichtenstein, designed by Austrian architects Anton Falkeis and Cornelia Falkeis-Senn; and seeing the 11th floor of Raimund Abraham's Austrian Cultural Forum. 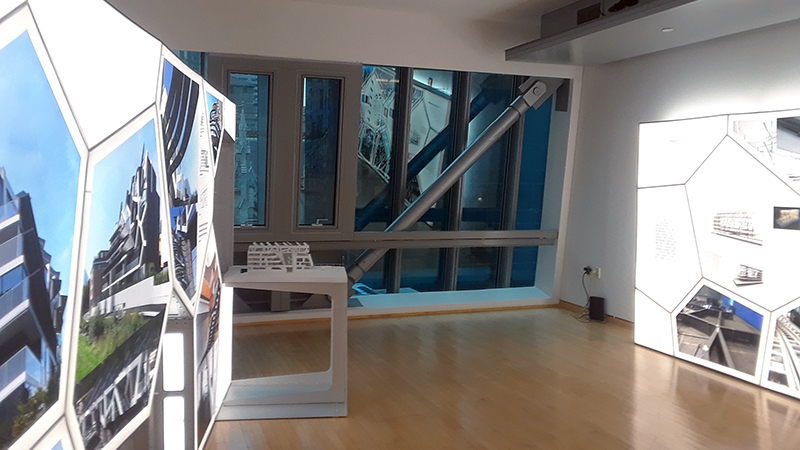 Instead of walking inside the building and taking a few steps to the public galleries on the lower floors, one must take an elevator ride to see the drawings, model, and photos of the Active Energy Building. Tucked in the building's tapered section between the ACFNY's offices and the apartment of ACFNY director Christine Moser, it's a trip most people will never take. Falkeis.architects' Active Energy Building is billed as "an energy autonomous building producing more energy that it consumes." In our age of climate change and dwindling resources, this should really be the goal of all buildings. Theirs does it through two systems: "PV-tracking systems and PCM-climate wings, part of a moving building envelope, harvest solar and interstellar radiation for controlling the building climate." Solar radiation is harvested for energy production and heating, while interstellar radiation (something I'm not familiar with) is harvested for cooling. Architecturally, the building's most attention-getting features are the movable PV panels on the roof and facade; their orientation is adjusted every five minutes. After the exhibition closes at ACFNY, it will head to California and then to Germany (venues TBD). 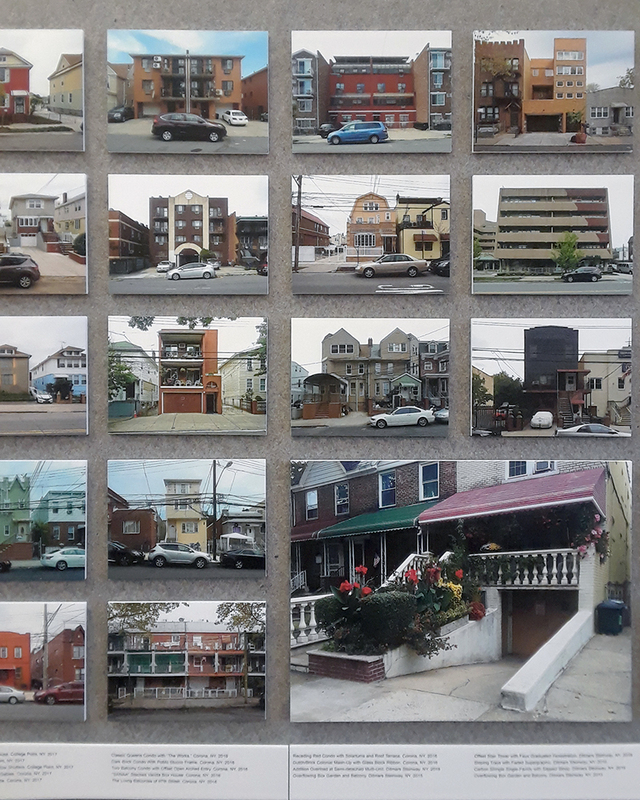 Originally set to close in December, this popular exhibition of architect/artist Rafael Herrin-Ferri's photographs of houses in the city's most diverse borough was extended for another month. It's located in the Architectural League offices and therefore is only open to the public one day a week, and for just four hours. 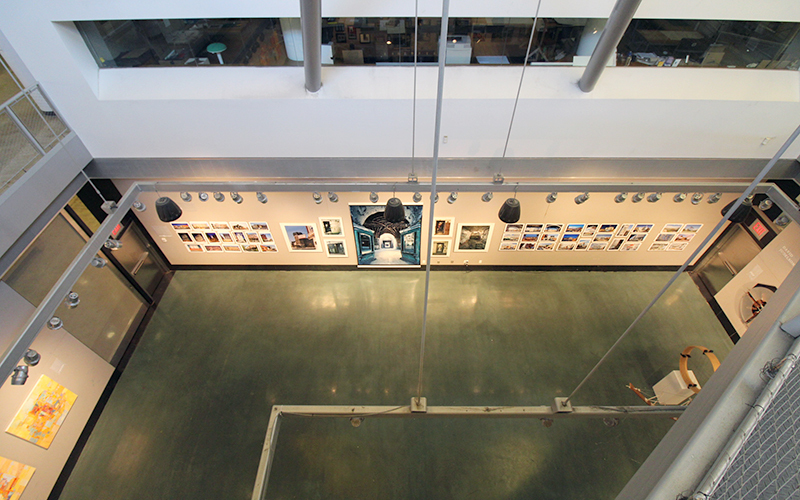 Two long walls astride some conference tables are filled with a grid of photos; most of them are small, but a few are larger and call attention to themselves. Herrin-Ferri's photos are primarily frontal, recalling the documentarian photos of Bernd and Hilla Becher – even the skies over the Queens houses are gray, like the skies of Germany in the earlier photos. 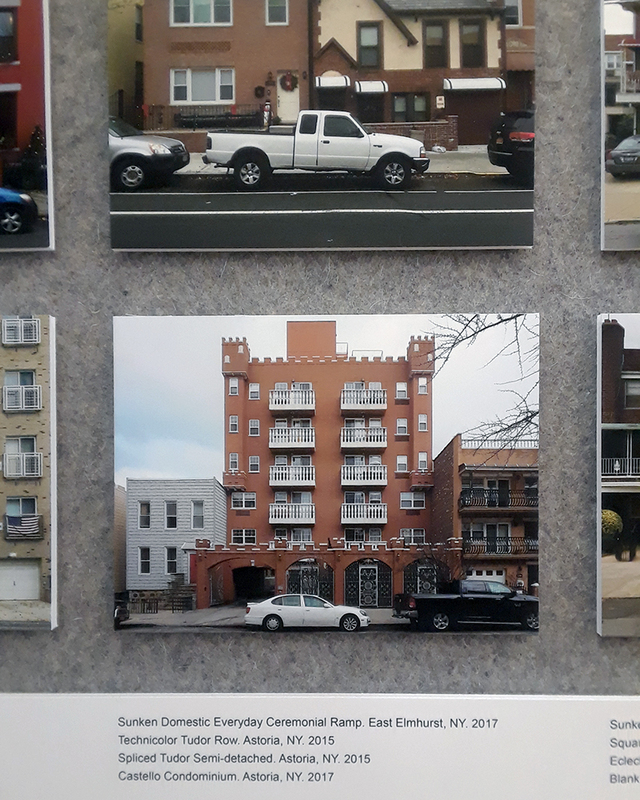 The exhibition comes out of Herrin-Ferri's ongoing project of documenting the borough's quirky residential architecture, which he presents on his All the Queens Houses blog. 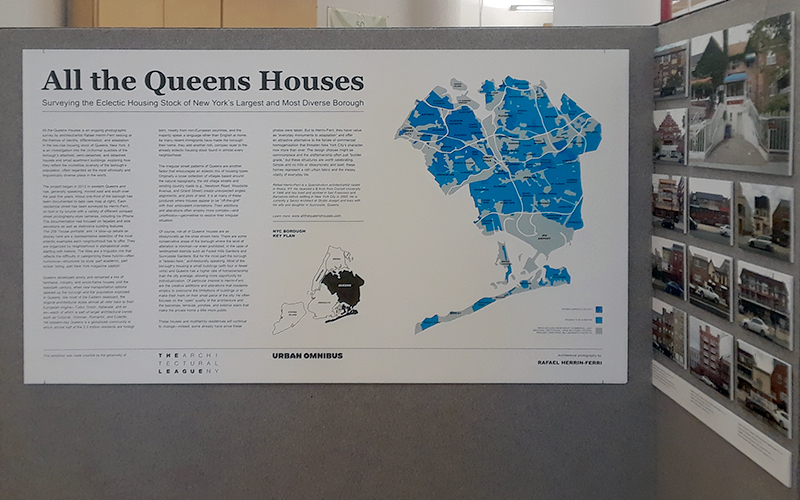 He described his process to the League's Emily Schmidt in a 2015 interview: "I worried that I would miss something, maybe the best example of a classic Queens building type, if I didn’t go street by street. So I decided to be very systematic and do a house-by-house-style survey." While this seems to align his project with the spate of the "All the ___" books floating around, the name of the blog and exhibition is closer to Humpty Dumpty: "All the King's horses and all the King's men couldn't put Humpty together again." Herrin-Ferri recognizes the borough's quirkiness as attempts at making buildings more livable – and in the process making individual statements and attracting the attention of the curious through his efforts. 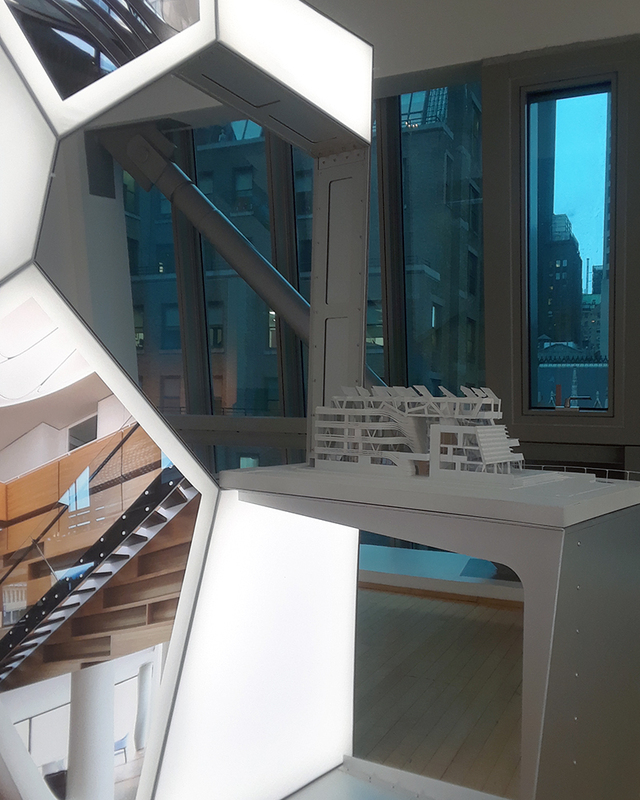 The exhibition now occupying the atrium of my alma mater's Spitzer School of Architecture presents the work of five faculty artists "that illustrate the dynamic relationship between art and architecture." 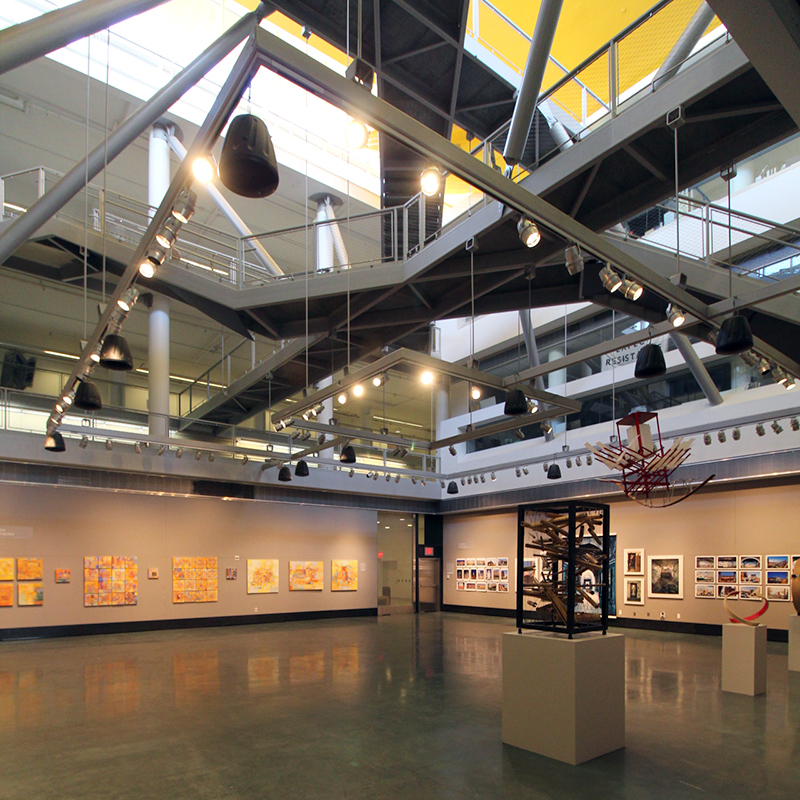 The works on display include Alan Feigenberg's photographs of people in the built environment, Danial Hauben's paintings of the Bronx, David Judelson's geometric sculptures, Irma Ostroff's colorful abstract paintings, and Albert Vecerka's professional and personal photographs of buildings. The show was curated by Lance Jay Brown, professor at CCNY. Of the five artists, I had the most familiarity with Vecerka beforehand, both his commissioned work for architects like Weiss/Manfredi (their new building at Cornell Tech is in the show) and his personal documentation of Manhattanville during its transformation into a new campus for Columbia University. The photographer lives and has a studio nearby, in Harlem, a neighborhood he has documented extensively and also displays here. 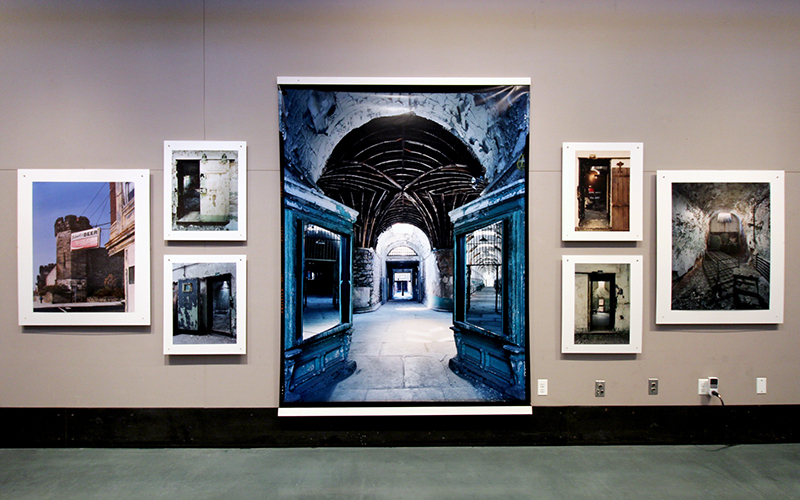 But circumstances led him to photograph the Eastern State Penitentiary in Philadelphia over a dozen years ago. Those photos, anchored by a huge print (below), stand out from the rest of his work. A 19th-century ruin (open to the public) rather than a new building or piece of urban vernacular, the former prison illustrates how the world is an open canvas open to the artistic gaze – be it these five artists or any others.